A common functional pattern, for lack of a better word, is to compose various functions together. This is often seen as an elegant way of combining multiple operations on a single data structure. But another advantage of composition is that it allows us to write faster, more efficient code. Very simply, composition is an operation that takes a function from a to b, and a function from b to c, and returns a function from a to c.
The arrows are functions, f and g, and the circles are types. Here composition allows us to construct a new arrow starting at the first circle, a, ending at the last circle, c. What’s interesting here is that we don’t care about the arrows, nor do we care about the circles — so long as the end of one arrow matches with the beginning of another, we can compose the arrows. For the sake of argument, suppose we have an array with 100,000 numbers in it, called nums. And suppose we are interested in performing some elementary operations over each element in the array. This maps double over nums, creating a new array, to which we map triple over, creating a new array, to which we map quad over… and so on. What’s important to notice here is that we are performing four mapping operations, which means we are building up three intermediate representations before returning our fourth array. Now, this is not ideal since the total number of maps, or passes over the array, is determined by the number of operations we want to perform, or O(n). A better solution would be one in which the number of passes over the array is just 1, or O(1). This can be achieved with function composition. 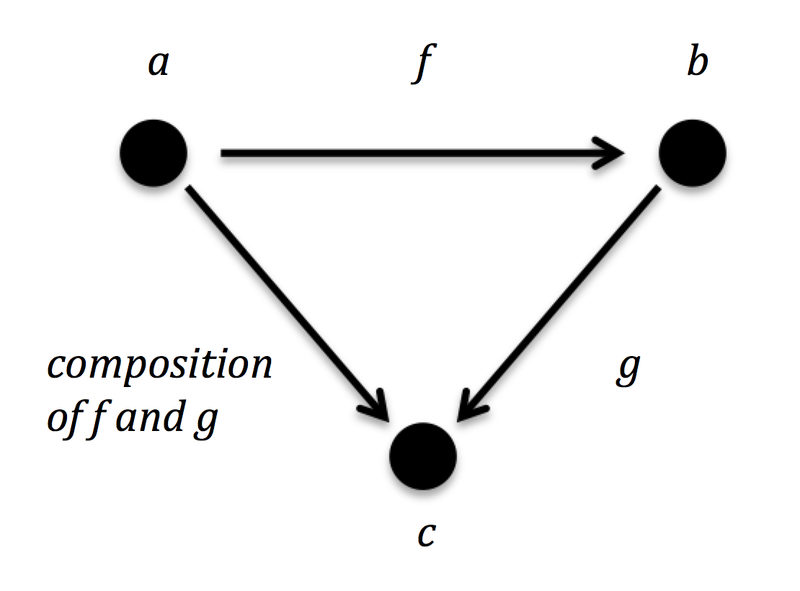 if you map f after mapping g, then that is the same as mapping a function which applies f after g.
In other words, a composition of maps is equal to a map of compositions. Therefore, map is distributive over function composition. This is easy to verify (and a more rigorous proof of this can be found in Graham Hutton’s Fold paper). Despite returning the same values, the difference between Ex 1 and Ex 2 is the evaluation: the first example involves two passes (maps) over the array (once for the function (*2) and once for the function (+10)) — causing an intermediate representation to be created — whereas the second involves only one pass over the array —creating no intermediate representation. This is probably one of the simplest functions writable — take an input and give it straight back without modification. Let’s look at what happens when we apply id to our array 10 times, just to be absurd. Again, composition is vastly faster, here around 6 times faster. Now for the caveats. These examples are simple and really don’t reflect what programmers do in their day to day work. Moreover, the data structures we have used are relatively large and simple. However, the simplicity in the code will hopefully help to demonstrate the point — composition does not create intermediate representations, allowing a single map to be used, meaning faster code. In itself that is an interesting result, but what makes this all the more significant is the fact that we arrived at this result purely by considering the abstract properties of our code. Namely, that map is distributive over function composition — i.e. map f . map g = map (f . g). We did not start with the code examples; instead, the code examples came out of these known mathematical properties. Software Engineer at Tracsis. All views my own.